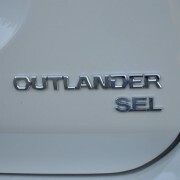 The most significant number about this Outlander isn’t the seats (7), doors (4) cylinders (4) or gears (0 – it’s a CVT). Rather the digit to remember is 21.7. 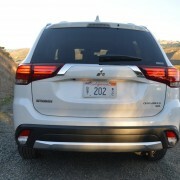 That’s the number of pounds each horsepower is tasked with carting around in this compact SUV. The higher the number the worse the performance. 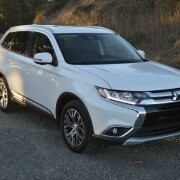 Dividing the Outlander’s curb weight of 3,610 pounds by the 166hp of its 4 cylinder engine yields the aforementioned 21.7lb/hp, a figure high enough to guarantee mediocre straight line performance. 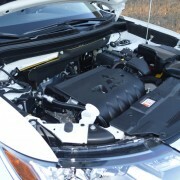 That CVT transmission is no help either, since it doesn’t allow you to select ratio ranges with its floor-mounted lever. Paddles are not offered to remedy the problem either. 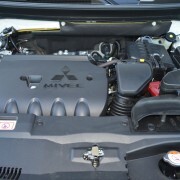 But help is available if you opt for the 224hp V6, which significantly improves the power to weight ratio to 16.1 lb/hp. 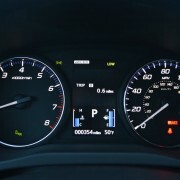 While the 23MPG overall fuel consumption of the V6 falls short of the four’s 26MPG rating, the tradeoff in performance is well worth the extra tab for gas. 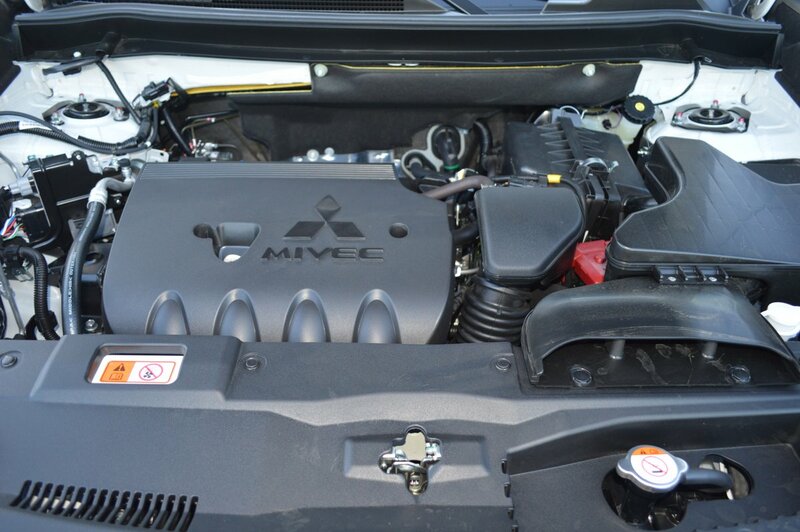 The V6 will jet the Outlander from 0-60mph in just 7.4 seconds versus 9.2 for the 166hp inline four. 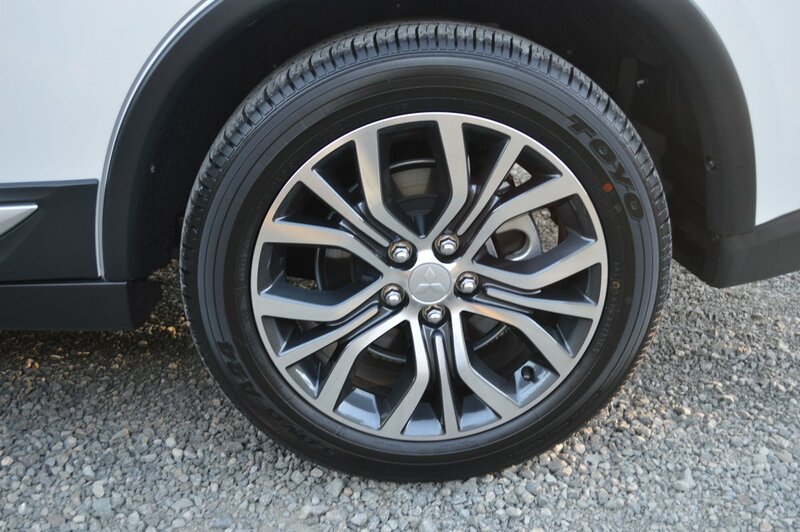 In both cases, however, you’re still stuck with the same non-responsive CVT transmission. 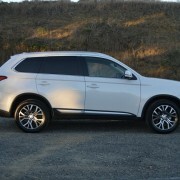 Aside from power train considerations, the Outlander presents a tidy and appealing package for family use. 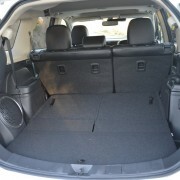 At the top of the list of attributes are those 7 available seats, a surprise bounty in any compact SUV. The two tail gunner seats are admittedly difficult to access, and tightly configured. 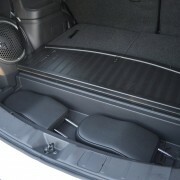 But this extra duet is perfect for occasional usage, and folds neatly out of the way when unneeded. 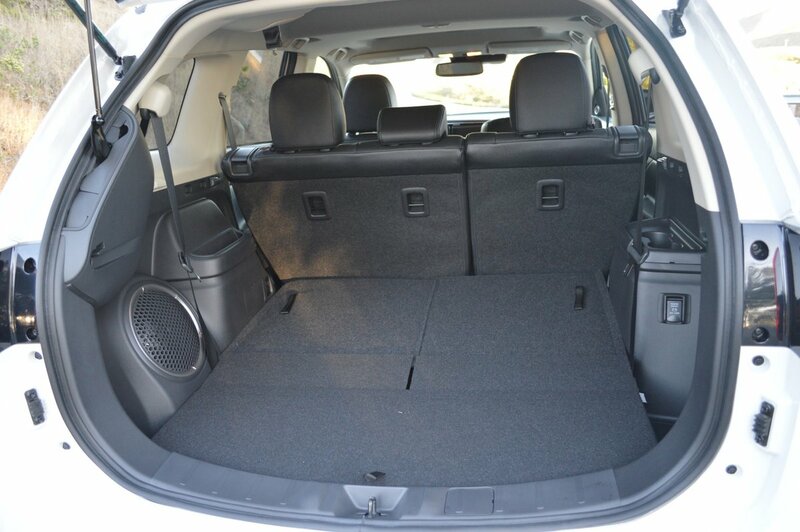 The second row also folds flat with ease, making the interior of the Outlander good for 32.5 cubic feet of storage space. We were able to slide a full size bike into that interior shelf. 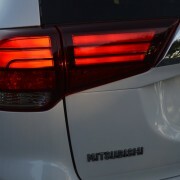 Just push the button to automatically swing the rear tailgate down. Note that the comparatively narrow (71 inch) width of this SUV made loading and unloading the bike more of a chore than you would expect. 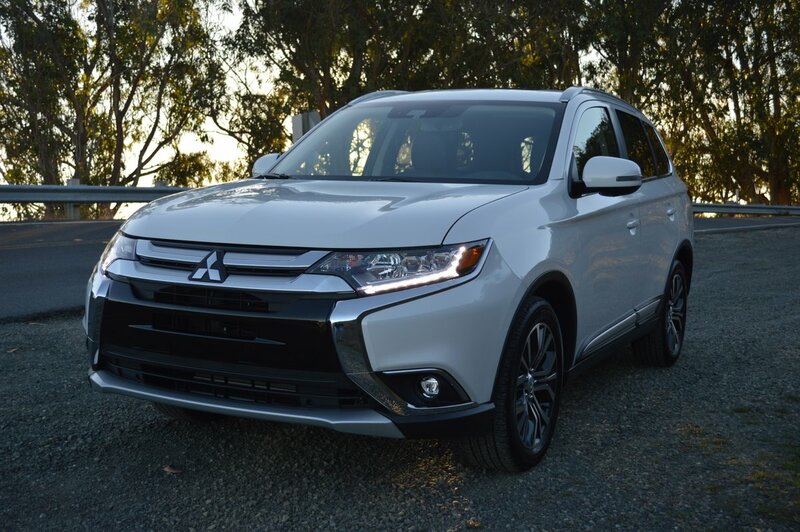 The 2018 Outlander keeps pace with recent safety upgrades if you order the SEL Touring Package, a $3,000 option. 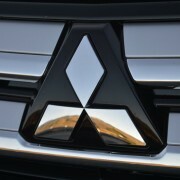 This group includes the following driver assistance features: forward collision mitigation, lane departure warning, adaptive cruise control, and automatic high beam. 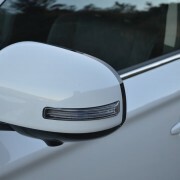 The Touring Package also provides a sizeable tilt/slide sunroof, a 710 watt Rockford Fosgate Premium Audio System with 9 speakers, a multi-view camera system, a heated steering wheel, plus LED headlights and fog lights. 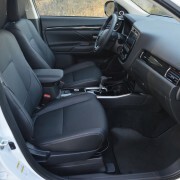 3 Stage heated front seats are already standard fitment on the Outlander, so the toasty steering wheel completes the heat source. 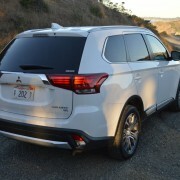 The adaptive cruise control proved rather herky-jerky on extended freeway runs, constantly speeding up, then applying the brakes. 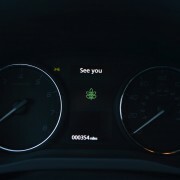 The lane departure warning (LDW) proved difficult to muzzle. 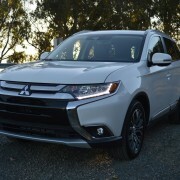 Although there’s a switch on the lower dash ostensibly provided to deactivate LDW, the system constantly reactivates when you restart the Outlander. If you love annoying and unnecessary alert chirps, you’ll appreciate this feature. 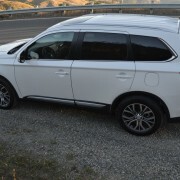 Even if you don’t order the optional SEL Touring Package, Mitsubishi still provides your Outlander with lots of standard on board safety technology, including Blind Spot Warning (BSW) with Rear Cross Traffic Alert (RCTA) and Lane Change Assist (LCA). 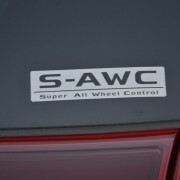 But because of sound cabin design, most of these acronym warning systems are superfluous. 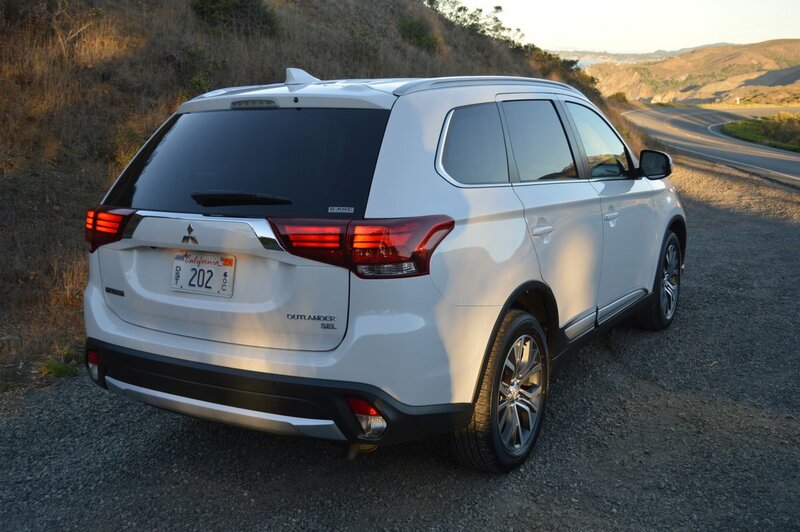 The best part of the Outlander’s design is its commanding full view seating position. 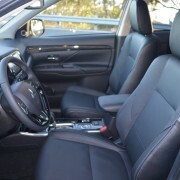 Even with the interior of our test vehicle upholstered in basic black, the cabin proved airy, expansive, and comforting. 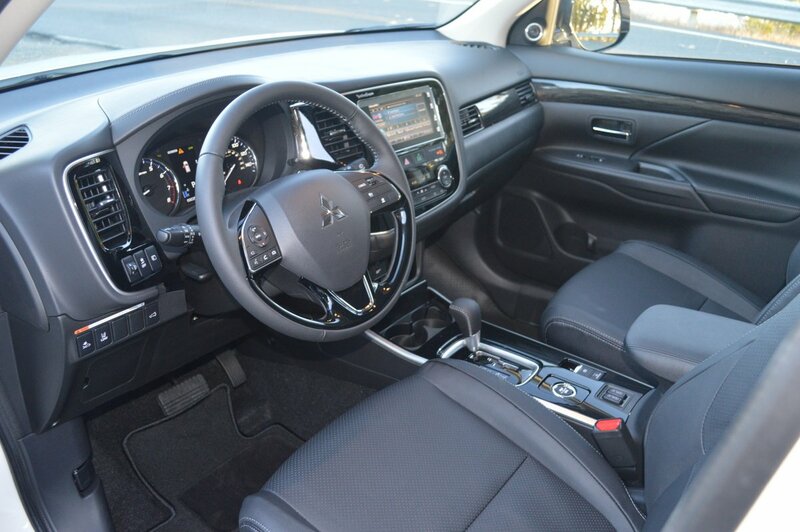 In particular, the new-for-2018, 7-inch display terminal on the dash is easy to decipher in all light situations, and a breeze to program for your free 3 month subscription to SiriusXM satellite radio. 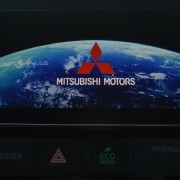 Best of all, Mitsubishi has resisted the impulse to lump all critical HVAC system settings into screen programming menus. Much to my relief, this dashboard still contains clearly marked, separate buttons for temperature settings, fan speed, and air placement. 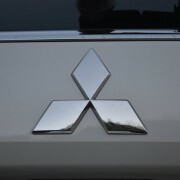 Handling of this Mitsubishi is predictable, with a low threshold of cornering speed. 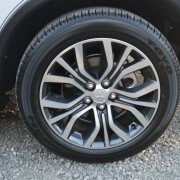 The fitted Toyo A24 tires (225/55R18) do little to generate grip. 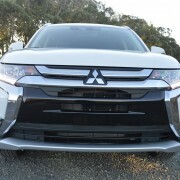 Push the Outlander hard in a turn and you quickly discover that soft springing and hard tires conspire to provide lots of initial understeer. 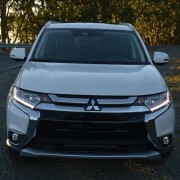 But though it might lack sporting accolades, the mildly revised 2018 Outlander remains a viable and affordable alternative in the compact SUV field – provided you ditch the anemic 4 cylinder engine in favor of the available V6.